Friends, a NAAN-WICH just showed up. And by naan-wich, I mean this pillowy sandwich packed with homemade falafel (5 ingredients! ), roasted veggies, and epic homemade sauce. The naan-wich is here. And so is 10 inches of snow! OH MY GOSH 😱 I love it. Minnesotans know – living here in the winter means you that for the days leading up to the winter season, you always wonder which day will be the one when you’ll wake up to The First Snow Morning. Is it going to be miserably icy cold? Are we excited about this? Did it stop being fun yet? You pull back the curtains and – surprise! – your whole world is laced with glittery white. ✨ You open your front door and seriously, guys, this might be my favorite ever – the world on The First Snow Morning is just so completely gentle and quiet. The streets and sidewalks haven’t been plowed yet which means the snow absorbs all the noise which means us quiet-lovers are all 🙏🙏🙏 about the whole thing. Cars, footsteps, animals… all of the usual neighborhood noises are perfectly muted by that soft layer of white sugar snow. So, answer: it hasn’t stopped being fun yet. And it’s even more fun when your sweatered-slippered-blanketed self sits inside on the couch with candles burning and Christmas music playing while EATING A NAAN-WICH stuffed with spicy falafel, roasted cauliflower and carrots, sun dried tomatoes, and magic green sauce. This naan-wich situation is just an evolution of the Ultimate Winter Bliss Bowls and also an answer to the question –> What else can I make that will continue to allow me to eat that spicy homemade falafel for as long as possible? 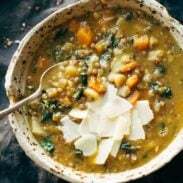 It is written as a recipe because this is, after all, a RECIPE-type blog, but it’s more of a generic formula for greatness. Also – you would not be mad at yourself if you decided to roll them up (like you would with a burrito), keep in the fridge, and then just grab them for on-the-go workday lunches. Maybe don’t add the Magic Green Sauce till after you pop it in the microwave to warm up for lunch – MGSauce does its best flavor work when it’s cold – but everything else is just sort of getting smushed up into deliciousness in that naan-wich so no worries on packing it all together a day or two in advance. So many things to do today – take Sage out for her first real playtime in the snow (this weekend at the dog park she half-heartedly ran after a ball for about 5 seconds – PROGRESS), take pictures of Sage in the snow, and snuggle with Sage on the couch while listening to Christmas music and scoping out the Cyber Monday deals like the true shopping introvert that I am. Er, no, Bjork, waaait – I meant working. I’ll be working. Promise. Naan-wich: 5 ingredient falafel, roasted veggies, and avocado sauce stuffed between pillowy garlic naan. Best sandwich recipe I’ve ever made. Make Ahead: Prepare the falafel and the Magic Green Sauce. It shouldn’t take more than 30 minutes for both. They can be made a day in advance and kept in the fridge, too. Roasted Veggies: Preheat the oven to 400 degrees. 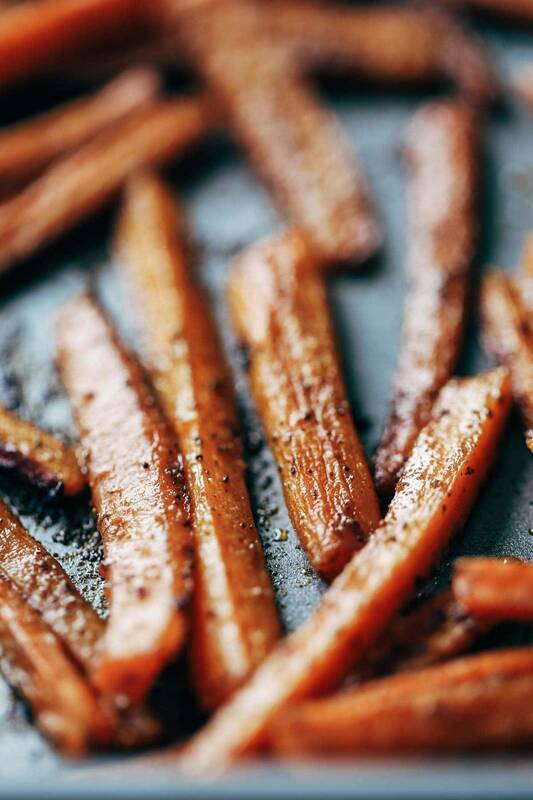 Peel the carrots and cut into thin strips and place on a roasting pan. Chop the cauliflower into small florets and place on a separate roasting pan. Drizzle each pan with oil and sprinkle each pan with cumin and salt + pepper to taste. Toss around on the pan to combine. Bake for 30 minutes, stirring occasionally. To get more browning, bake for an additional 10-15 minutes. When the veggies are done, remove from oven and set aside to cool. Sun Dried Tomato Spread: Drain off most of the excess oil from the sun dried tomatoes and pulse through a food processor for a chunky, spread-able texture. Assembly: Warm up the naan so it’s nice and soft. 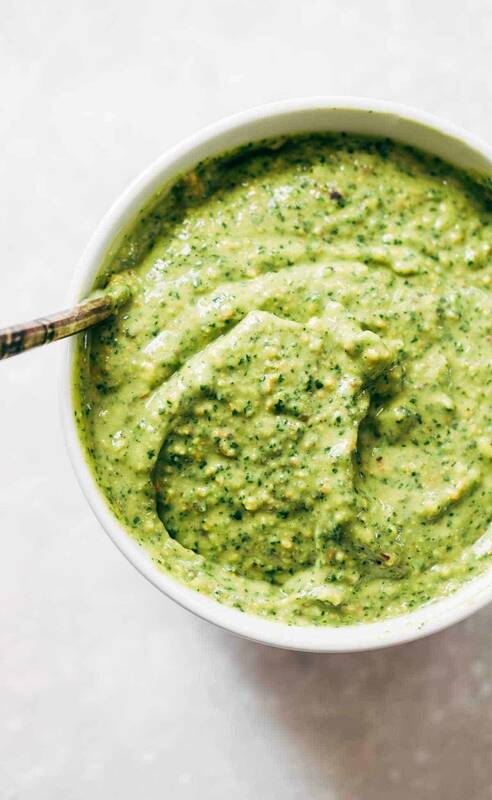 Spread with Magic Green Sauce and layer with roasted carrots, cauliflower, sun dried tomato spread, falafel, and cilantro leaves. My falafels were a little bit round and chubby, so I just gently pressed them into more of a veggie burger shape and that helped with sandwich assembly. I like to use Stonefire Garlic Naan which I buy at Target! The nutrition facts will vary so much depending on how you build your naan-wiches that I decided to skip them for this recipe. Each of the individual recipes for the naan-wich elements (sauce, falafel) have their own nutrition label in the original post. The naan and sundried tomatoes should have nutrition labels on the packages, assuming those are store-bought. If you want to see snaps of the white sugar snow wonderland that I am currently living in and how many naan-wiches I’m actually eating, you can find me (and Sage) on Snapchat! Search for pinchofyum. PS. 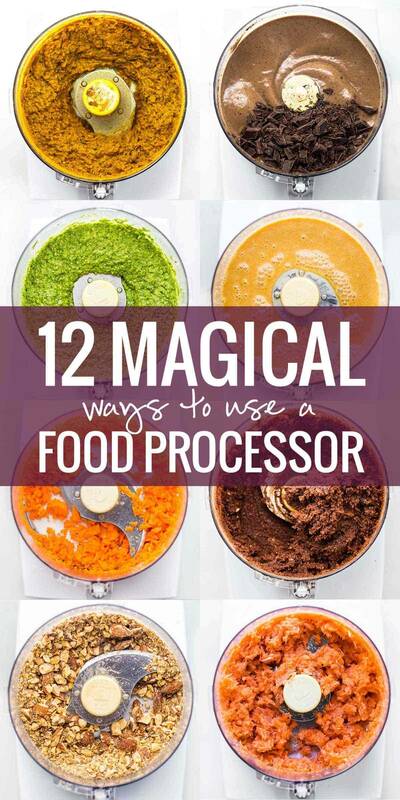 I used my food processor for this recipe – and I love it so much that I wrote this post showing off 12 Magical Ways To Use A Food Processor! ✨ I loooove that thing. Rather than the usual soup, his Naan sandwich is not a bad idea at all for this weather. Shoot! 🙁 Stay safe out there! OMG falafel naan-wich, that’s so clever! I need this in my life, like immediately. I’m going to try making this this weekend! I also heard about all of the snow you were getting over there! We’re still waiting in NYC, I’m not sure if I’m looking forward to it or not lol At least maybe for Christmas! Yes please! Sign me up. I am so looking forward to making this – your falafel recipe is amazing, and now with naan and sun dried tomatoes and magic green sauce?? Forget it; I’m leaving work to go home right now to put this together. Need this in my face NOW! We’re not getting any snow any time soon down here in south Louisiana, but I can still enjoy a falafel naan-wich, right? Right. i have been dreaming of this falafel ever since you posted..and now this naan-wich. i cant wait.. Thanks Dixya! hope you like it! Whoa, yes pleaaaaase!! I’m dying right now. This is perfect. This looks amazing I love the colours and the flavours!!! A long, long time ago…I’m talking over 50 years..my family and I lived up in the very top of the northeastern part of Maine for 3 years. I so relate to the bliss of the quiet after a big snow fall. There is nothing like it. Thanks for the reminder. The recipe sounds delicious!!! But sadly, I cannot eat some of the ingredients, so I will have to enjoy it through your words. Aw, fun to hear that Sharon! OMG, this looks so good. I’m going to make the falafel just for this, and eat it for lunch all week long. No one can stop me. And I’m with you on the First Snow Morning- it’s magical. It won’t stop being fun until March. hahaha or maybe January. 🙂 But we’ll see. Holding on to the magic!! MustmustMUST MAKE!!! I am bound and determined to make this happen!! I mean, it has pretty much all my favorite food elements…except chocolate, ’cause that’d be gross. But a sandwich!! <- my favorite ethnic food And falafel!! (Okay, sandwiches aren't ethnic food, but Greek food really IS my favorite ethnic food.) Plus, of course, MGSAUCE!!! (Sorry for all the shouting, I'm just *so* food stoked!) Add to that roasted veggies, sun-dried tomatoes, and thick flatbread, and you have my food-loving heart for-ever!! Oh, Lindsay, words fail me…this. looks. heavenly. Thank you!! Brilliant. What a great idea! As a reader of your blog I love it when you make something and then feature it in several other recipes afterwards. I love to simplify my meal planning and using the same ingredients more than once is the most efficient way to do so. Makes my weekend prep and weeknight assembling a breeze! Thanks! Glad to hear that, Jessie! It makes me so hungry. So hungry. I love falafel! This looks so delicious! Its nice to see a hearty but healthy dish. I’m not a fan of winter at all! I am an elementary school teacher and I’ve lived in Wisconsin for over 50 years and would move to the tropics tomorrow. My husband and his business will keep us here awhile longer. That said, I am a huge fan of your blog and recipes! I’ll be making these naanwiches soon. By the way, the turkey pho idea, brilliant and delicious! So making this ASAP! Whole Foods makes a delicious garlic naan, which I currently have in the fridge. Must be meant to be! Oh my goodness I am SOO excited about this brilliant invention of a naan-wich. This is just so cool! I really want this in my hands RIGHT now. Also I’m happy you love your white velvety snow cause living in New York the snow just disappears immediately or overnight a secret massive army of snow plows ravish the city getting rid of all the snow so you didn’t even know it had snowed the next morning. It’s so sad! I’m pinning this because I so want to try it. I love love love love a falafel. We’ve got a small shop nearby and the falafel guys are pure geniuses. The pics looks really delicious though and the ingredients are some of my favs. Hope you like it, Vickie! We made this last night using lavash to make it into a wrap. I used hummus and store bought falafels. It was so delicious. The magic green sauce makes it! Thanks for the recipe. Glad you liked it, Gretchen! This is definitely the best looking sandwich i’ve seen in forever! Absolutely love all things Middle Eastern since my days of Kibbutz living. Thanks Lindsay for all your awesome recipes!